There are certain athletic pursuits I am comfortable saying aren’t for me given the high likelihood of falling and/or crashing into stationary objects. Yes, I’m speaking of sports that involve snow and ice and hurtling yourself down or across slippery surfaces at high rates of speed. That’s why I find it slightly ironic that I’m excited to share our winter ‘backyard’ with you. That’s right! Our pond has frozen over. Also, we have neighbors! Who knew?!?! 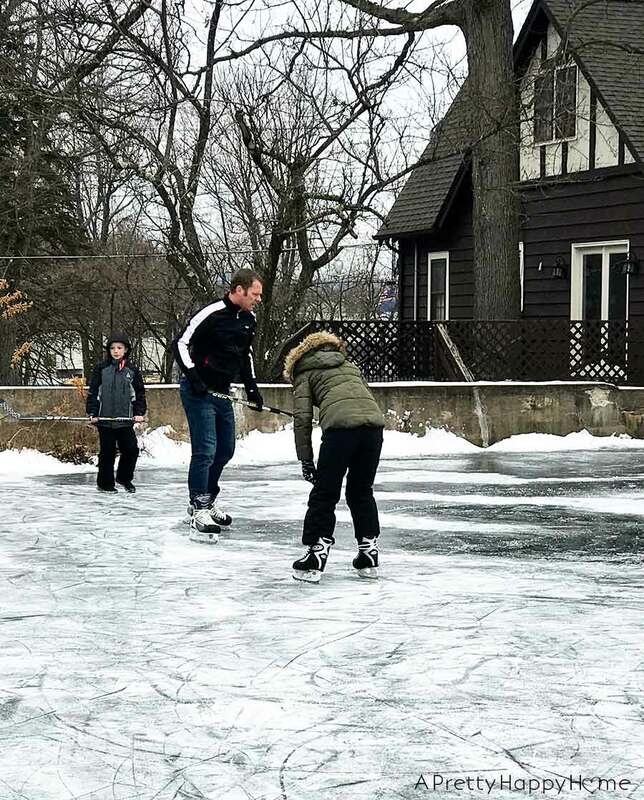 Before the grandparents start sending me messages about being careful about skating on our winter backyard, let me reassure you we are. Handy Husband has been studiously measuring the ice in anticipation of it being thick enough to skate on. How does he measure the thickness of the ice on our pond? Well, he uses our cordless drill to drill into the ice with a super long drill bit and then sticks a tape measure in the hole to see how deep it is. He does this in varying spots across the pond and it’s something he has to check quite regularly especially as weather conditions fluctuate. 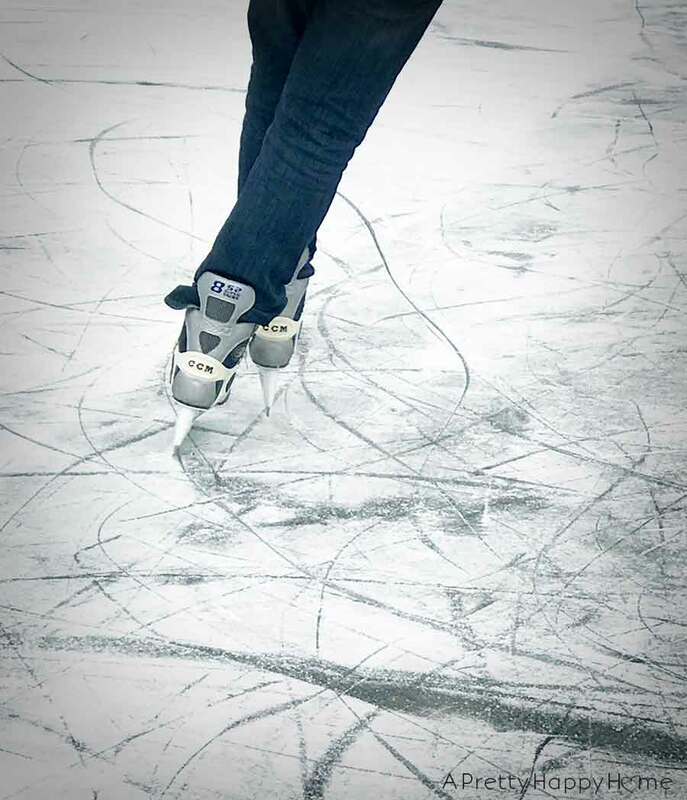 4 inches of ice is the thickness you need to be considered safe for skating. If it gets up to 8 inches thick we could drive a small car out there. We won’t, but we could. I kid you not, for all the places I’ve lived (including Minnesota) I don’t think I’ve ever walked on a frozen pond or lake before. Reference the opening sentence of this post to see why. I ignored my nagging sense of self-preservation and walked out here to get pictures of Handy Husband in his element and my kiddos trying to decide if this was their element. AND I ALMOST SLIPPED AND FELL. I did not like it. I’m giraffe tall and I’m no longer a spring chicken. If I slip and fall on the frozen pond, it’s a long way down and I know it is going to hurt. Thankfully, kids don’t worry about falling quite as much. My daughter enjoys skating and had some lessons a few years ago, but hasn’t had a ton of opportunity to practice until now. She’s wearing my hockey skates. I’m not sure if it’s more shocking that I have hockey skates or that she can fit into them! I’m slowly accepting that my kids are growing up, so the real shocker here is that I have skates and I don’t skate. It’s what you do when you’re young and dumb and get married to someone who grew up playing hockey in Canada. Don’t worry. At some point you’re older and wiser and still married to someone who grew up playing hockey in Canada. That’s when you say, “Go have fun skating without me.” And your spouse is secretly so relieved you said that! My son has also had ice skating lessons and he’s never taken to it. He’s trying again since the ice is in our backyard. So, that’s something. Except in these pictures he’s just “skating” in his boots. Up until yesterday I would have said he takes after me in this regard, but there was a skating breakthrough (not to be confused with an ice breakthrough) and hope has been restored. 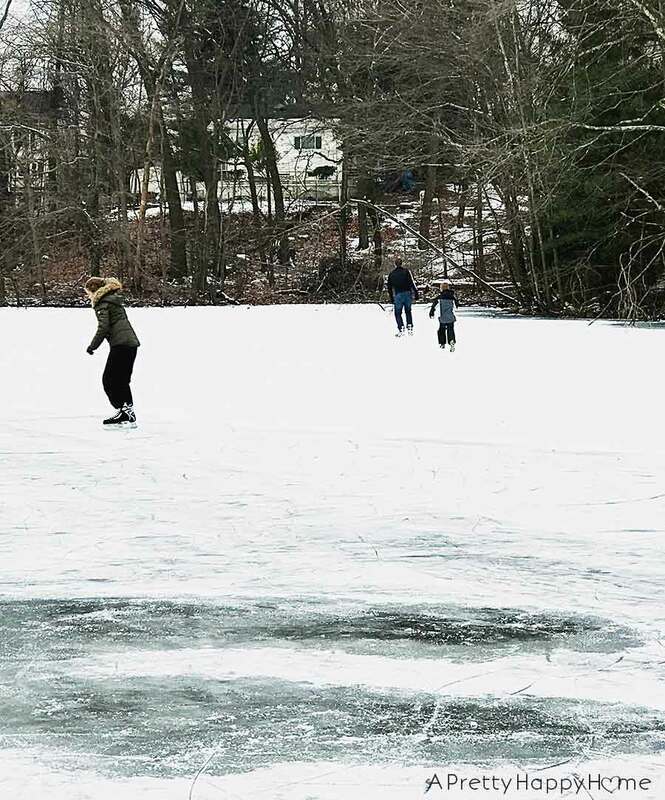 Whether my children enjoy skating or not, I know this experience of being able to walk five steps out our back door to go skating on the frozen pond is something that will be embedded in their memories forever. This is not our forever home, so we are fully taking advantage of these moments and experiences while we are here. Despite how cool all this skating is (no weather pun intended), I will be really, really happy when our winter backyard transitions into springtime. Handy Husband likes this drill because it gets the job done (duh!) and it has a lifetime warranty. 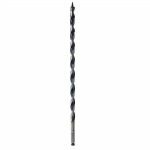 If something goes wrong with the drill he can take it back to Home Depot and get a new one. 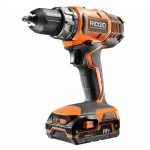 The fact that he’s never had to take any of his Ridgid tools in to be replaced tells him that’s why they have the lifetime warranty. Also, he likes the little light that comes on when he’s using the drill so he can see where he’s drilling. This is the massive drill bit Handy Husband attaches to our Ridgid Cordless Drill to drill into the ice to see if it is thick enough for skating. I guess you could call this one a lifesaver! *Affiliate links in this post. We get credit if you use our links to make a purchase and it doesn’t cost you anything extra. It’s how we keep this blog afloat, so thank you! 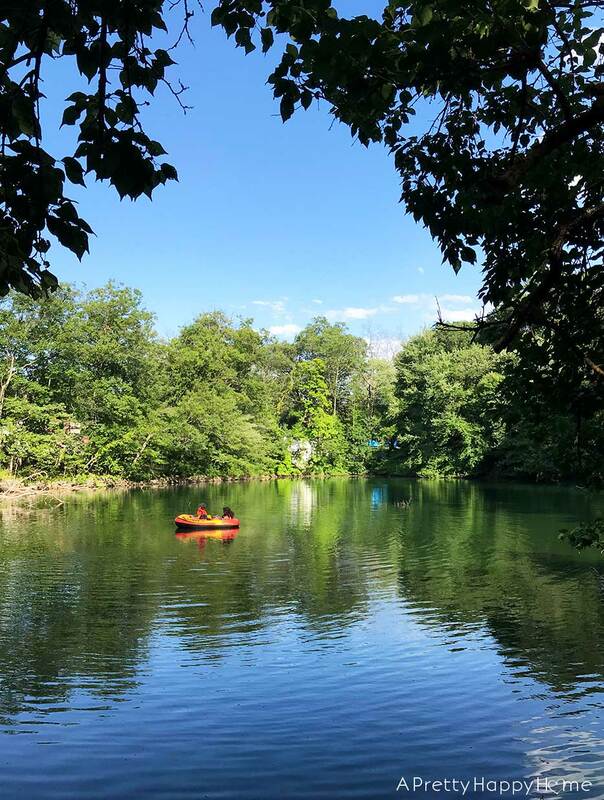 Such a good blog about such fun memories you are all making. I think it’s so cool that the kids are learning to ice skate. Me too – It really is a skill they will be able to enjoy most of their lives if they get it down now! What a fun experience for all of you. 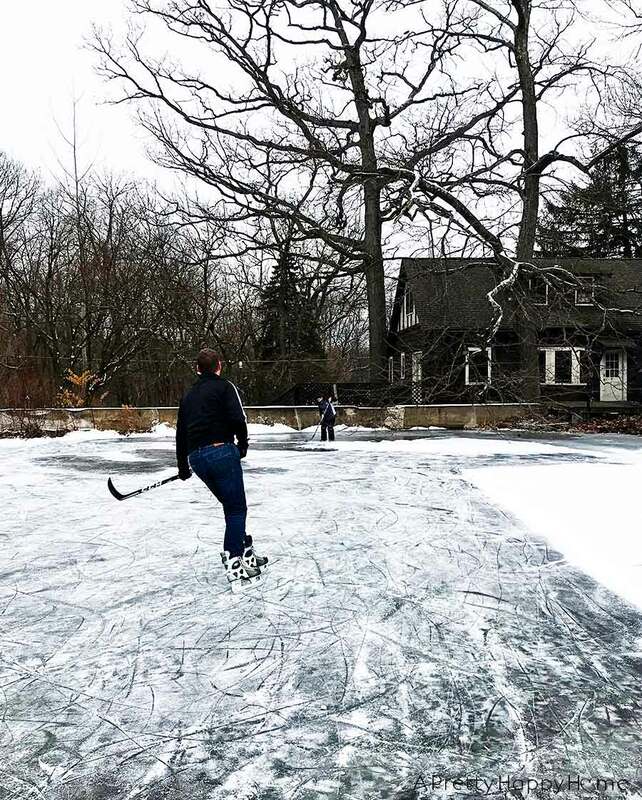 Having your own ice skating rink right outside your door is wonderful. I am so glad your kids are learning to ice skate. It will bring them a lot of fun as they grow up. They won’t want to leave this pond when you decide to move on. It has given you all so much fun. Enjoy it while you can. I know! Isn’t that the truth…the next house definitely won’t be this cool!